Tor is a free-software anonymizing network that helps people around the world use the Internet in safety. Tor's 5500 volunteer relays carry traffic for around a million daily users, including ordinary citizens who want protection from identity theft and prying corporations, corporations who want to look at a competitor's website in private, people around the world whose Internet connections are censored, and even governments and law enforcement. The last year has included major cryptographic upgrades in the Tor software, dozens of research papers on attacking and improving the Tor design, mainstream press about government attempts to attack the Tor network, discussions about funding, FBI/NSA exploitation of Tor Browser users, botnet related load on the Tor network, and other important topics. In this talk I'll aim to strike a balance between explaining Tor's "intellectual merit" side (all the neat research problems that Tor raises, and how we've positioned ourselves to get so much attention from academics) and Tor's "broader impact" side (the many ways that Tor has changed lives around the world). 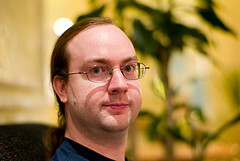 Roger Dingledine is project leader and research director for The Tor Project, a US non-profit working on anonymity research and development. While at MIT he developed Free Haven, one of the early peer-to-peer systems that emphasized resource management while maintaining anonymity for its users. He works with the Electronic Frontier Foundation, the US Navy, Voice of America, the National Science Foundation, and other organizations to design and develop systems for anonymity, traffic analysis resistance, and censorship resistance. He organizes academic conferences on anonymity, speaks at such events as Blackhat, Defcon, Toorcon, and the CCC congresses, and also does tutorials on anonymity for national and foreign law enforcement. Roger was honored in 2006 as one of the top 35 innovators under the age of 35 by Technology Review magazine, and honored in 2012 by Foreign Policy magazine as one of the 100 top global thinkers. To watch the recorded presentation, register at:http://www.tvworldwide.com/events/nsf/140114/.